America is still a land of untouched beauty and natural wonders. 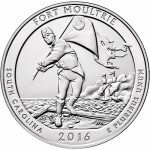 The majesty of America’s national parks and forests is captured in brilliant images on the reverse side of America the Beautiful Silver Coins. Today, Silver.com offers a special product in the ATB Series. 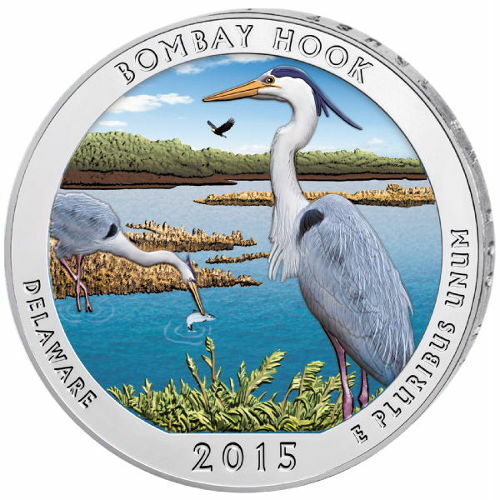 These 2015 5 oz ATB Bombay Hook Silver Coins are available with a colorized finish on the reverse side. Represents the state of Delaware. Part of the ATB Silver Coin Series. Colorized by private entity. Features colorized finish on the reverse. Bombay Hook National Wildlife Refuge is one of the most important natural environments in the United States. Established in 1937 using federal duck stamp funds, the 25 square miles of land along Delaware’s Atlantic Coast in Kent County is an important feature along the Atlantic Flyway. Each year, hundreds of thousands of migratory birds moving from north to south, and vice versa, use Bombay Hook National Wildlife Refuge as a stopover place for food, rest, and breeding. Ducks, geese, cranes, and a variety of other migratory waterfowl can be found here on a yearly basis. 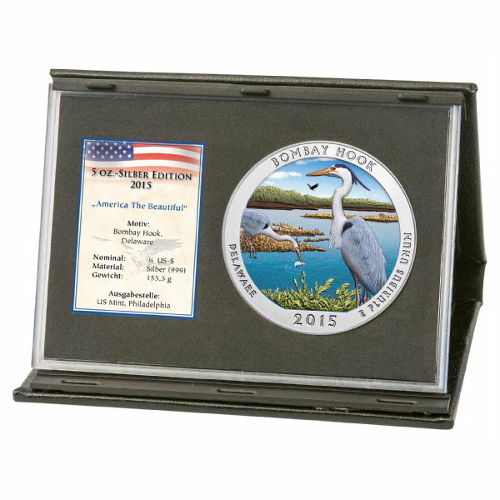 Each of these 2015 5 oz ATB Colorized Bombay Hook Silver Coins features brilliant natural coloring on the reverse design. Bearing the image of migratory waterfowl and the coastline of Delaware, the primary image on the reverse is surrounded by the state of issue, name of the park, “E Pluribus Unum,” and the year of minting. On the obverse side is the left-profile portrait of President George Washington. His bust has appeared on the obverse of American 25-cent pieces since 1932, when John Flanagan updated an image of Washington originally created by sculptor William Cousins in 1786. Although the United States Mint originally produced these coins, the US Mint does not engage in colorization on its products during initial striking. These coins have been purchased and colorized by Emporium Hamburg, a German coin trading company with 40 years of experience in the precious metals industry. If you have any questions, a Silver.com associate is waiting to help you. Our associates are available on the phone at 888-989-7223, online using our live web chat service, or via email. 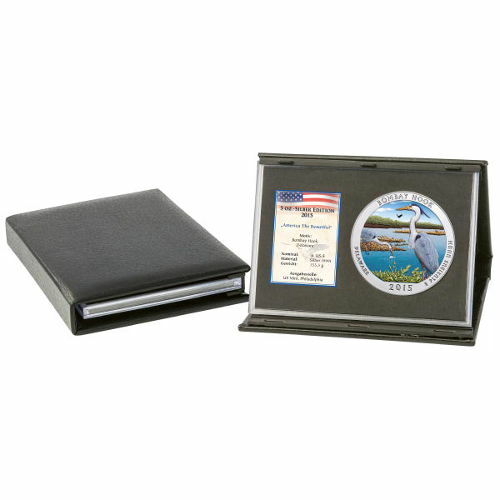 If you are looking for similar products, please stop by our Silver Dollars page.